Rose Williams skillfully leads the reader through the maze of power plays and the gradual rise of sovereign states that followed the collapse of the Roman Empire. Readers will appreciate Williams' engaging style and her ability to synthesize succinctly this busy period of history. 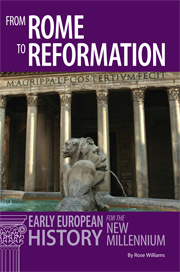 Recognizing the symbiotic relationship between literature and the era in which it was produced, From Rome to Reformation: Early European History for the New Millennium provides a comprehensive overview of the interconnecting historical events, literary figures, and intellectual developments in European history and its Latin literature. This is a perfect companion text for courses in the humanities, western civilization, and Latin. The author, in collaboration with John Traupman, PhD, has adjusted this date to reflect better the two hundred years.